(8" measured on the arc of the ball). 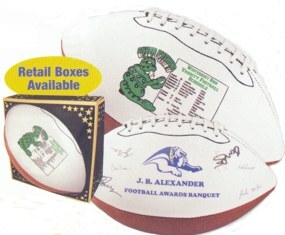 Features white autograph panels & re-inflatable athletic valve. Permanent markers recommended for clear, long lasting autograph. Imprint area: 2-1/2"W x 1-1/2"H, or 1-3/4" in diameter. (10" measured on the arc of the ball). Imprint area: 3-1/2"W x 1-3/4"H and or 2-3/4" in diameter. (14" measured on the arc of the ball). Imprint area: 5"W x 3"H.
Imprint area: 3-1/2"W x 1-3/4"H or 2-1/4" in diameter. Imprint area: 1-2 color 5"W x 3"H 3-4 color imprint area 4-1/4" x 2"H or 3" in diameter. Order your Custom Printed Signature Footballs now & save! click here. FUL L CO LOR transfer available on FSB, MSFB, WL-SIGFM Add $0.60 each upcharge. For FSFB, WL-SIGF Add $2.67 each upcharge. FULL COLOR transfer (logo/text/or photo). Imprint size: SFB 2 1/2"W x 1 2/2H" oval. MSFB, WL-SIGFM 3 1/2"W x 1 3/4"H oval. FSFB & WL-SIGF 4-1/2"W x 2-3/4"H Oval. Note: All prices, quantities, sizes, brand name, pictures, and/ or colors are subject to change without notice. Signature Football: Actual dimensions may vary slightly. Set-up (screen/ plate charge): Full size, add $50.00 per imprint, per color. 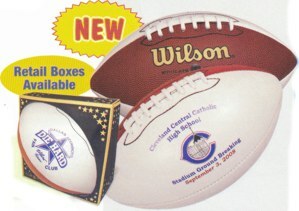 Mini Footballs: add $40.00 per imprint, per color. Requirements to prepare and e-mail artwork to us, click here. Blank (unimprinted) SFB 8" Mini Signature Footballs: $5.83 each, 20 pieces minimum order. MSFB $10.00 each; FSFB $13.33 each, minimum order 9 pieces. WL-SIFM $17.00 Each, minimum order 10 pieces. Full size WL-SIGF $40.00 each, minimum order 5 pieces. . Deflation: Add $0.35 per ball. Not available on full color transfer. Random samples: SFB $13.00 each. FSFB $28.00 each. WL-SIGF $55.00 each. Shipping will be additional. Retail Boxes: Mini $2.50 each. Black, Red, Royal Blue, Navy Blue, Baby Blue, Green, Forest Green, Orange, Yellow, Purple, Brown, Gold, Silver, Maroon. Add $0.30 per color, per imprint. Exact registration can not be guaranteed. (two color max. for full size footballs; 4-color max. for mini signature footballs). Add $0.30 per color per imprint. (two color max. for full size footballs; 4-color max. for mini signature footballs). Add $40.00 per color. Exact color match cannot be guaranteed. Please provide black and white camera ready ( or color separated, if more than one color) artwork to size (see "imprint area" to size the artwork accordingly). (No halftone artwork). If you need artwork preparation, connect to the following link: Requirements to prepare and e-mail artwork to us, click here. From receipt of complete order and approved artwork, please allow approximately 8-12 working days production time in the plant on custom or imprinted merchandise, unless otherwise noted. Rush service available on 10-50 Full Size Signature Footballs; Mini Signature Footballs 100 pieces maximum one color, one side imprint only for $60.00 per order service charge. Once we receive your complete order & your artwork is approved by our art department, we will ship from our plant in approximately 5-working days. Please call us for service availability at that particular time. Order NOW and save time and money! To place your order, click here. Then follow the instructions in the ordering form, or call us at the telephone number shown at the end of each page and place your order. Remember. Customer satisfaction and high quality service to our customers is our main goal. For your convenience, we accept Master card, Visa, American Express and Discover credit cards. Order your signature footballs Now! click here. E-mail to Customer Service , click here.